Pristine beaches, reefs and oceans may be the Turks and Caicos Islands leading attraction, but our dining options are surely a close second. With more than 100 restaurants on Providenciales alone, your options are almost infinite. Our dining establishments run the gamut from elegant, romantic and casually formal, to barefoot with toes in the sand. In between, there are bistros, cafeteria style luncheonettes, bakeries, coffee shops, ice cream parlours, pizzerias, and delicatessens. At the Seven Stars Resort enjoy dining under the stars or indoors in air-conditioned comfort at Seven. You’ll find places to eat which are nestled in tropical gardens or shaded by a grove of palm trees. Some sit right on the beach where the tradewinds cool you as you enjoy your meal. Others are tucked away, off the beaten track, but they are well worth discovering. The resort restaurants are many and varied, and often include live music by our talented local musicians. The ambience, and the choice of venues are bested only by the cuisines offered by the chefs of the Turks and Caicos. Asian, Cantonese, French, Indian, Italian, Jamaican, Japanese, Mediterranean, Mexican, and Thai restaurants serve dishes which often have a Caribbean twist. Then there are our local restaurants, which specialize in lobster, conch, baked mac 'n cheese, peas ‘n rice, and fried plantain that will leave you crying more. The freshest ingredients, fresh seafood, and locally grown herbs are imaginatively combined to bring you the best dining experience. Baci Ristorante located in Turtle Cove, Providenciales (Provo), Turks and Caicos Islands. Fine Italian dining with a wonderful wrought iron and Spanish tile ambiance. Nightly fresh fish specials. Veal is a specialty, excellent pasta, chicken, lobsters in-season and brick oven pizzas. Popular and comfortable bar. Open for dinner and “drinkies” from 6:00pm six nights and lunch served Monday thru Friday. Indoor and shaded terrace dining. Anything on the dinner menu and pizzas available for carry-out. Closed Sunday. Dinner reservations recommended. Fine dining featuring genuine Italian cuisine by executive chef and owner Cosimo Tripodi. Nightly specials. Full bar and extensive wine cellar. The Glass House is elevated above a tropical garden with indoor or covered terrace seating. Serving dinner six nights from 6:00pm, closed Sunday. Private catering available for parties, weddings and receptions. Reservations recommended! A new and extensive menu of pizzas and salads are served in the BELLA LUNA PIZZERIA garden terraces and bar downstairs. Hand stretched pizzas come with red or white sauce and a host of toppings or create your own. Carry Out available. This is a great eatery in the Saltmills – an American Diner with a Caribbean twist. They serve lunch and dinners from 11am until 10pm. Big juicy burgers, veggie burgers, steak, pasta, fish, and chicken, so there really is something for everyone. This popular restaurant in Five Cays, right on the beach, serves up the freshest local conch and seafood in a variety of recipes. Extensive menu served under the palms. Beer, rum, wines. Live music everyday from 1:00 to 4:00pm. Live music Friday, Saturday, and Sunday nights! Constant tradewinds. Tourists and locals – this is a great place to hang. To reach Cabana Beach Bar & Grill, walk through Ocean Club (East) or walk from the beach and it’s just past Club Med. The restaurant serves breakfast, lunch and dinner. Coffee starts at 8 am with a full breakfast menu. Menu offers everything from pasta, to salads and fish tacos. Complimentary shuttle for Ocean Club guests. Daily drink specials and happy hour from 5 pm - 6:30 pm. Live music from 6 pm - 9 pm on Sunday, Monday and Friday! A favourite dining spot of island residents, the al fresco, deck-style restaurant, friendly staff and superb selection of fine wines makes Caicos Café a terrific place for casual romantic dining. Chef Max Olivari presents a notable savoury menu offering Mediterranean specialties, house-made pastas, fresh-baked breads, succulent barbecue meats, grilled local seafood and delightful house-made desserts. Open for dinner Monday - Saturday 6-10PM. Reservations recommended. Nestled under a canopy of coconut palms, join us for a unique dining experience. The location is special as is our food, dictated by the freshest ingredients available. The Menu includes the daily island catch including local fish and conch. Our impressive wine list from around the world along with Chef and Owner Stuart Gray’s delectable desserts is simply a must! Dinner from 6:00pm. Closed Mondays. Reservations necessary! Located on Governors Road, Providenciales (Provo), Turks and Caicos Islands. Provo's newest culinary sensation! Located inside the bright orange entrance next to Coco Bistro. Casual dining served from cocovan’s gleaming silver Airstream food truck. Seating is in the coconut groves at picnic tables decked with lanterns. Dine on a choice of tacos, sliders, gorgonzola fries, classic poutine, shrimp mac n cheese balls and more. Menu items change monthly. Full bar with beer, wines, cocktails and a Tequila well. No reservations necessary. Serving dinner nightly from 5 to 10pm. Located on Governors Road, Providenciales (Provo), Turks and Caicos Islands. Contemporary Caribbean gourmet cuisine served in an exquisite private tropical garden setting, open to the stars or under terrace. Executive chef and owner Paul Newman’s truly divine dining. Menu specials change nightly. Extensive wine list. The Dessert Martinis are all the rage! Closed on Tuesday. Available for private events. Reservations highly recommended. Located at the Caribbean Paradise Inn, Providenciales (Provo), Turks & Caicos Islands. Iron Chef Hot and Spicy - Toronto 2011 Winner! This popular, established party time Pub is a multiple screen Sports Bar that serves terrific food - lunch and dinner daily, on the terraced patio. The kitchen stays open late every night. Daily Happy Hour Specials from 5 to 7pm! Take the Suicide Wing Challenge. Monday Night - 1st Turks Head tap beer (after 5pm) is FREE! Tuesday and Thursday join in for Karaoke. Wednesday features BBQ Grill Jerk Night specials. Friday is Country Night with Line Dancing. Saturday is DJ Night GO until 2am. Sunday is Pizza and Sports on the Big Screens. Watch the board for more Special Events. Windsong’s private al fresco dining experience is the perfect accompaniment to the most memorable of Caribbean holidays. Watch a stunning Grace Bay sunset on a pristine Caribbean dune while you delight your palate. Beachfront dining at its best with fresh, sumptuous menu selections prepared to perfection. Enjoy an intimate ambience under a blue sky during the day, and under a star-filled sky at night. Seating at Dune is limited, so booking in advance is advised. Daily happy hour 5 pm - 7 pm. Two-for-one drink specials. Reservations are required. Our new tapas bar! Mediterranean inspired tapas menu with specials and desserts daily. Full wine bar, single malts and fine mixed drinks. Open every day from 11 am - 2 am. Happy hour from 5 pm - 7 pm. A relaxing and friendly atmosphere, offering indoor and outdoor seating serving breakfast, lunch, and Sunday brunch. Guests can enjoy the spectacular views of the 18th hole from our wrap-around terrace, or the elegant air-conditioned bar. For your special celebration or wedding reception, this is ideal as the event space is ample with parking in abundance. Bar open daily 7am to close. Restaurant open Monday to Friday: 7:00am-3:00pm. Saturday: 7:00am-8pm. Sunday brunch: 9am-3pm. Located at The Regent Village. Open for lunch and dinner. Garam Masala serves authentic Indian cuisine made with traditional spices and methods. The menu was created and all dishes are prepared by two experienced chefs from Northern India. Genuine charcoal Tandoor oven. Dinner served seven nights a week 5:30pm-10:00pm. Infiniti - An elegant, oceanfront restaurant boasting fresh ingredients and modern presentations. Dinner served nightly 6:30 pm - 9:30 pm. The Grill - A casual, oceanside bistro serving breakfast, lunch and dinner. Open every day, 7 am - 9:30 pm. Krave - Gourmet comfort food. Children friendly. Open to the public for dinner on Friday, Saturday and Sunday evenings. Reservations are required. Grace's Cottage presents a unique blend of Caribbean ingredients and gourmet cuisine. At this elegant restaurant, choose from a scallops, conch, lobster and fresh fish, and beef tenderloin on the gourmet Caribbean menu, which showcases the region's strong ethnic influences and finest ingredients. The extensive wine list offers an excellent selection. And try their fabulous desserts. Open for more than 15 years, Hole in the Wall is probably the most well-known Caribbean restaurant on Providenciales. Located on Old Airport Road, the restaurant is famous for their jerk sauce! You control the amount of sauce you use on the perfectly cooked chicken or pork, as spicy as you like. Enjoy the relaxed atmosphere in air-conditioning or upper deck. Open for breakfast, lunch and dinner. Have a beer with the islanders who make Hole in the Wall a regular haunt. Pick-up, driop-off and delivery available. Situated in a lively, relaxed, beach bar atmosphere, recently opened Jack’s Fountain will be your favourite watering hole on Providenciales. The restaurant and bar feature fresh seafood and steak and unique, speciality items not available in any other restaurant on island. Open six days a week, for lunch and dinner. Speciality nights: Sunday Roast Night (includes all of the fixings and dessert), Wednesday “Hump Day” Wings and Taco Night with a special on draft beer, and Friday is Seafood Fest Night with all kinds of specials on mussels, clams, oysters, and white or rosé wine. Poolside dining open for breakfast, lunch and dinner in a picturesque setting. Breakfast served 7:30 am - 10:30 am, can be continental or made to order. Speciality pizzas and fruit smoothies are served for lunch with signature salads, grilled or chilled sandwiches, and seasonal fruit. Room and beach service is available. Saturdays offer Caribbean jerk barbecue with DJ poolside from 6 pm - 9 pm. Dine overlooking Chalk Sound National Park. Mediterranean / Caribbean cuisine. Extensive menu and wine list. Famous for our Tapas! The Islands ‘Most Reasonable’ Full Bar. Open seven days from 10am - 10pm for lunch and dinner. Daytime, Sunset, Catered Pontoon Boat Cruises across Chalk Sound! Dinner reservations suggested. Take South Dock Road, turn right at Chalk Sound Drive to Neptune Villas on your right. Enjoy fresh local Mahi Mahi, snapper and tuna and choice cuts of beef and lamb at this French café in the Regent Village. Daily specials, delightful desserts, excellent wines and a comfortable view of passersby. The deli serves wonderful fresh sandwiches and cheeses. Open for lunch and dinners. True Italian comfort food! Fresh ingredients, homemade pastas, classic salads, cured meats, imported cheeses, marinated olives, flat bread pizzas and more. Lupo is an intimate Italian restaurant located right in the heart of Grace Bay. Dine with us or take away. Simple, healthy and delicious gourmet meals at a great value. Indoor and outdoor seating. Enjoy the best sunset from the highest (above sea level) restaurant on the island. Separate wine bar lounge and deck overlooks Turtle Cove Marina with panoramic views from Blue Hills to Grace Bay. Enjoy sunset cocktails. Featuring international cuisine with island flavours and chef’s specials each evening. Your hosts and owners Tracey and Gianni Caporuscio have been serving simple uncomplicated food at Magnolia since 2002. Extensive wine list. Open for dinner six nights a week from 5:30pm. Closed Mondays. Reservations strongly recommended. Located overlooking Turtle Cove Marina on Providenciales. Enjoy waterfront dining at the new location overlooking Turtle Cove Marina. Open for breakfast, lunch and dinner from 8am to 10pm seven days a week. Enjoy sunset cocktails. 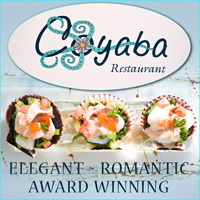 Set Price Dinner just $44 on Monday thru Thursday nights, except Holidays. Childrens Menu. Wine - Bar - Grill. Extensive wine list, relaxing mahogany bar, friendly ambiance. Wine flights and tasting plates always available. International menu with a Caribbean flair. Fresh locally caught seafood. Live music under the trees. Open Late! Dinner served nightly until 10:30pm. Indoor air conditioned or island garden seating. Full conference facility and function room, corporate events, weddings, tastings, special occasion catering - on-site or off. Reservations recommended. Located at Ocean Club East Resort, Ocean Club Plaza across from the Provo Golf Club. A level of culinary sophistication seldom found beyond the bounds of major metropolitan areas. Cuisine celebrating Caribbean flavours with culinary delights from around the world and a wine cellar for the most discerning palates. Breakfast and dinner served daily. L'Attitude Bar - The elegant bar and cigar lounge area serves light meals until midnight. 72West and Plunge Bar - Beachside dining with a casual flair. Serving lunch and drinks throughout the day, dinner served seasonally, poolside at The Palms, Grace Bay Beach, Providenciales (Provo), Turks & Caicos Islands. This dining destination at The Somerset, serves an island fusion of flavours at breakfast and dinner. They have a Wood Stone oven and a unique open air kitchen. This elegant restaurant combines the best of Europe, the sea and the islands, served in their main dining area or at the pool and beach. Enjoy the Tuesday night Beach BBQ Party with bonfire, music and dancing. Reservations recommended. Located at the popular Royal West Indies Resort, the kitchen is the domain of Chef Peter Redstone. The Pelican Bay menu is fresh, exciting and extensive enough to please anyone in your dining party. Expanded to include Local Cuisine and Seafood Specialties. Breakfast, lunch and dinner served with popular Happy Hour Bar. Jerk Fiesta Sundays! Lobster Extravaganza Wednesdays! Surf & Turks Fridays! Our pizza dough is freshly made everyday - homemade sauce and the freshest toppings. Specialty pizzas. Open 7 days 11:30 to 9:30, Fri / Sat open ’til 10pm. Dine in or carry-out. Free delivery for minimum order. Carry out & delivery. Now located at the Cinema Plaza. Enjoy our full genuine Italian menu with fresh baked nightly specials, pasta, salads and garlic bread. Genuine brick oven pizza. Full bar, beer and wine. Open 7 days from 11:30am until late. Free delivery for minimum order. Carry out & delivery. Located Grace Bay Road upper level at the Grace Bay Plaza. SEVEN - Elevated Island Cuisine - Every meal at Seven is an exceptional culinary experience. A masterful blend of rare spices, island-grown ingredients, and exotic techniques. Choose from Seven’s fully air-conditioned restaurant and bar or dine under the palms in a romantic star-lit tropical garden. Reservations at Seven are available six nights a week. THE DECK - The Ultimate in Barefoot Elegance - There is no better place to sip your favourite drink and enjoy the sound of gently lapping waves. Drop by for our popular Bites and Bits and sundown celebration of light and sound as you watch the sky over Grace Bay collect the night’s first stars with entertainment nightly. Or enjoy Sunday’s Island BBQ. 72ºWest provides beach-side dining with a decidedly casual flair. Delight in a family-friendly, Caribbean-inspired menu offering enjoyably simple, lighter fare, chilled, grilled and filled with flavour. Lunch is served throughout the day, beachside, on the lower pool deck. Dinner is served seasonally. Plunge Bar, nestled within the stunning infinity pool, serves cooling drinks and tempting cocktails. Featuring lunch and dinner menus with something for everyone, fast, friendly service. Nightly Specials. Indoor and outdoor deck seating. Wednesday Fish ‘n’ Chips Special. Friday Happy Hour 5-7pm! Popular bar. Game room with slots. Child friendly menu. Call for Take-Out or Reservations. Located at Harbour Towne directly over the water in Turtle Cove, Provo. Located in Ports of Call Shopping Village, Skull Rock Cantina is the new hot spot in Grace Bay to get your Tex-Mex fix. The restaurant lassoes up fajitas, burritos, enchiladas, chimichangas, tacos and more. (Trust us, it’ll be hard to pick a favourite.) Stop in each day to discover what the daily drink special is and enjoy the lively atmosphere. Open from 8 am. DAILY DRINK SPECIALS $9. Tex-Mex Specials from $12. Serving breakfast, lunch and dinner daily in an elegant beachfront setting, from 7:30am – 10pm. Specialising in tapas, Japanese, sushi, Teppanyaki, grill and cocktails. Solana is one of the most recent restaurants to hit the food scene, offering a unique and fun mix of sushi and Teppanyaki, with chefs showcasing their specialist knife skills right in front of you. Dinner reservations recommended. Turks & Caicos Restaurant Review of Solana! Somewhere - there is a Café with a view, on the beach. Specialty coffees, herbal teas and mixed drink menu. Casual dining featuring Tex-Mex favourites. Sunset specials everyday from one hour before to one hour after sunset. Open from very early to very late. Directly on Grace Bay Beach at Coral Gardens Resort. Enjoy an intimate gourmet dinner at Stelle, under the stars by the pool or on our beautiful garden terrace. Savour modern mediterranean cuisine showcasing the very best local ingredients, featuring fresh fish and seafood. Come to relax, come to celebrate! SUI-REN is an exquisite fine dining restaurant on Providenciales, located at The Shore Club. The restaurant’s celebrated chefs combine Peruvian and Japanese cuisine into one delicious experience. Offering a wide variety of gastronomic temptations of fresh seafood, organic produce and more, dining at SUI-REN is a “must” when on the island. Reservations necessary. Over 60 different tantilising traditional Thai appetisers and entrees. Choose from soups, salads, noodles, curries, fried rice, pork, chicken, beef, shrimp or vegetarian on the mild side or up to ‘three chilies’ hot and spicy! Open seven days a week for lunch and dinner. CARRY OUT. See full menu in the Providenciales Dining Guide. Authentic Italian cuisine, made with imported Italian ingredients. This classy café offers an Italian marble bar and several second level dining terraces, great for people-watching, plus indoor air conditioned dining. The menu changes monthly to reflect the latest imported ingredients, meats and cheeses. Handmade pastas – this IS the real thing. Saturday nights enjoy hand stretched pizzas and specialties from the brick oven. Asian inspired grill with a wok station creating fresh and healthy yet flavourful dishes for breakfast, lunch and dinner. Many refreshing dishes are available at great value, including choicest salads, dim sums and poke bowls. Inspired by wellness living. The menu features many vegan, gluten-free and keto dishes as well. Open daily from 7:30 am - 3 pm and 5 pm - 9:45 pm. Reservations recommended. Drift – A modern beachfront dining experience on Grace Bay Beach. The open-air restaurant serves dinner nightly 6 pm - 10 pm. Bar + Kitchen – An elegant international menu complements a relaxed poolside location for a comfortably elegant dining experience – serving breakfast, lunch and dinner. Dinner reservations are required. Yoshis provides World Class Japanese Sushi. Open for lunch and dinner. At Yoshis, Chef Yoshi Ono’s extensive menu is ever changing and includes noodles, lobster, beef, steaks, chicken teriyaki and more specials. Dine in the air conditioned dining room or on the patio. Closed Sunday. Take-out available. Dinner reservations for groups. Yoshis is located at The Saltmills, Grace Bay, Providenciales. See menu in the Providenciales Dining Guide. Scrumptious seafood meticulously prepared. Modern Mediterranean cuisine with local specialties like conch as well as grouper, snapper, mahi mahi and (when in season) the Caribbean spiny lobster. Outdoor seating wraps around the resort's beach. Experience the rising or setting sun, while enjoying a delicious feast. Lunch: Noon-5:00pm Dinner: 6:00pm-9:00pm.